In the early 1970s, National Geographic Society started the production of a new set of ocean floor maps. Inspired by Heinrich C. Berann relief maps, Tibor G. Tóth painted the ocean floor to bring an unexplored undersea world to a fascinating physical and plastic shape. 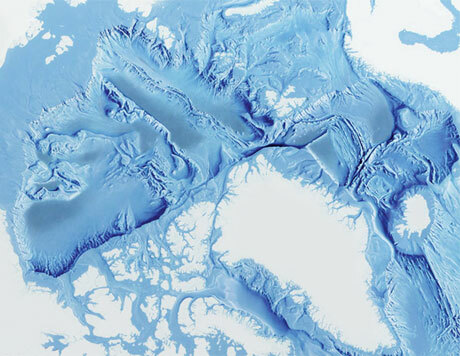 “Arctic Ocean relief” (section) – acrylic, painted by Tibor G. Tóth, © National Geographic Society. With the obvious difference of a limited blue palette, the process basically was the same as that of the physical continental maps. As a source for relief detail, Tibor G. Tóth used the General Bathymetric Charts of the Oceans (GEBCO) along with the Berann maps, and the earlier charts produced by Marie Tharp and Bruce Heezen.